Happy Friday! It’s time for a new Five Friday Favorites, but first some administrative business to discuss! First off, I am thoroughly enjoying seeing so many of you jump on this pantry/freezer cleanout challenge. I did this last year, but not in a formal way. And this year I took the same approach. I just mentioned on Instagram that I wasn’t going grocery shopping, but instead I was going to use what I had in the pantry and freezer. It has been very satisfying and even more satisfying has been seeing so many of you feel great about doing the same in your kitchens! Yay for us! Next, Clean Eating Magazine has decided to re-launch the Batch Cooking 101 online course I developed for them last fall! Very exciting! It’s a 6 or 7 week program, depending on if you eat animal protein, and it starts on January 15th. For my readers and students, they have given me a discount code to offer you which is PSALZMAN50 for $50 Off. Click here for more information. Speaking of online cooking classes, I am going to be offering the classes I teach every month online as well. I was going to launch them this week, but I decided to wait until the Clean Eating course began to avoid confusion. I teach the same menu 4 days a week for an entire month at private homes in Los Angeles and since I can’t add more days to the week, I decided to film one of my classes and offer them online. More information will be coming very soon. But if you haven’t been able to get into one of my classes or you don’t live in the area and you’ve wanted to learn from me in the kitchen, this is it! There will be a private Facebook page coming which will offer daily support as well as regular FB Lives to offer real-time interaction. I will be filming this month’s class within the next few days and then I’ll be ready to put it out there. I am super excited!! There is nothing I enjoy more than supporting mom and pop companies. Our Board Boutique is a father and daughter team who make custom/personalized boards as well as other fun items. I had a custom cutting board made for me and I love the look and quality. 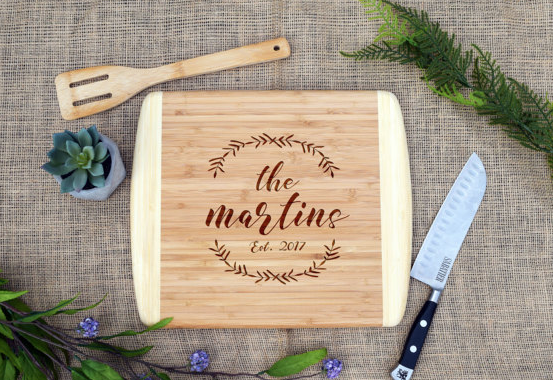 Their products would make a great, present, housewarming gift, wedding gift, or etc. Here’s the link to their website where you can choose the product you like and then have it customized. If your looking for something made with love, then check out this sweet small family company. One of the benefits of teaching in other people’s homes is that I get to see some really organized and inspiring kitchens. By far the most organized is my friend Nancy Sunkin’s and it’s likely because she is a professional kitchen organizer! I am always coveting things in her pantry or cabinets. Most recently I saw this clear divided lazy susan in one of her cupboards and I drove directly to the Container Store after class to buy one for my pantry. I LOVE lazy susans and I have two stainless steel ones in my fridge, one for nut butters and one for jams. 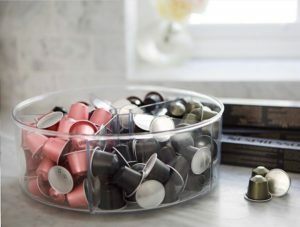 This one has compartments which makes it perfect for tea bags and coffee pods like I saw in Nancy’s kitchen, or snacks which is how I am using it in may pantry. Now instead of having things on top of each other or things hidden in the back of the shelf so no one can see them, we can spin the wheel around and everything is within easy access. I am in love with this! Check out Nancy’s website for more inspo. Link to the product on the Container Store’s website. I don’t post my son’s lunches on Instagram because he has a very limited repertoire of what he likes to bring and it’s usually leftovers from last night’s dinner and/or soup. I have not always had great luck with thermoses, many of which didn’t last long or leaked. Soup leaking in a backpack is NOT OK. I found this one from Bentology on Thrive Market’s website and it is the best one I have used so far. It is 11 ounces and I use it to keep hot food warm and cold food cold. Most importantly, it is BPA Free, Non-Toxic, and Phthalate Free. They are available in three colors: Teal, Pink, and Black. Here’s the link to the product on Thrive Market’s website. When I looked at this product on Amazon, it had mixed reviews. We have had no issues in 2 years with this thermos. I have tried the Thermos brand, and disliked it very much. The seal broke often and water got into the thermos. There is another brand on amazon that has gotten good reviews called Foogo, but I haven’t tried it. The key with keeping warm food warm is to pour boiling water into the thermos to “preheat” it. 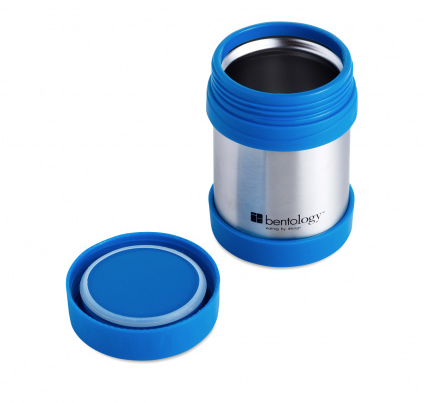 Allow the thermos interior to heat up while you reheat your food. Then pour the water out and add your food and seal it up. I do that every time and my kids have never complained about cold soup! Food allergies and intolerances are becoming more and more common. With my daughter in town for winter break, I wanted to buy her bread that she can enjoy without having to worry about gluten. A friend of mine recommended Barely Bread because of all the amazing ingredients. So many gluten-free breads are super refined and loaded with junk. Not only is this bread gluten free, it is also yeast & soy free, preservative free, paleo, loaded with fiber, and low glycemic (great for diabetics, too). With all the benefits of this bread company, I decided I wanted to eat it too! 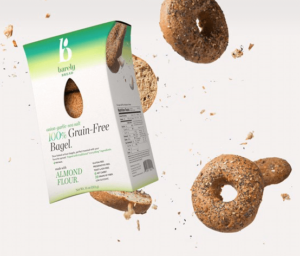 I ordered their onion-garlic-sea-salt bagel and to me it tasted like any other bread (maybe even better) and it kept me full due to a whopping 13 grams of fiber! You can buy their products on their website, some natural markets, or in the LA area from MilkAndEggs.com. I get SO many questions about nonstick cookware and if I can recommend a brand without PTFE/PFOA/PFOS. I really have no use for nonstick pans since I can cook everything I need in a cast iron skillet or a stainless skillet without sticking. Except bananas. I have a hard time caramelizing bananas without a sticky mess. I was introduced to these Gotham Steel Nonstick pans first by my mother-in-law who likes them a lot. I’ve been using them for a few weeks now and I think they’re great. Their equipment is coated with ceramic and titanium, so food definitely does not stick. I understand you can even skip the oil. Here’s the thing though – you cannot use these over high heat and you should always follow the manufacturer’s recommendations for care and usage. 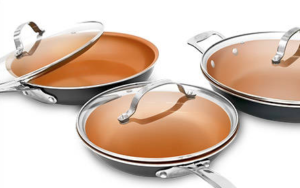 These pans even come with a 90 day guarantee which is great if you want to try them out. Here’s their website for more info. Here’s a link to my previous Five Friday Favorites. All opinions here are my own and this post is not sponsored in any way by the companies mentioned. 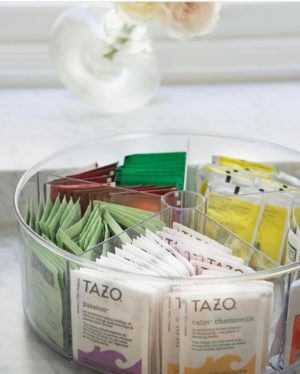 Buying Nancy’s suggestion for sure to organize my teas! I might need to buy a second one. I love it! So excited I will be able to take your classes online! I enjoyed the few classes I was able to attend in person a few years back and feel so lucky I will get to attend again with this new format! Thank you! Thank you for the enthusiasm! Love ur freezer/pantry challenge. And I am going to the same. I am soooo excited that we can now take your classes online! I have been hoping you would do this for a couple years 🙂 Can’t wait to follow along with you from San Francisco! Thanks, Shari. I appreciate the positive energy and encouragement! I’m so excited that your classes will be available online. I live in England now and I get so jealous when I see the new recipes come out for the classes. I still cook from your website minimum 3 meals a week! Will you be posting the recipes for the classes on your blog or will they only be available to those that sign up for the online class? I have always waited until after I have finished teaching the recipes before posting. Some never get posted (I.e. I saved them for my book), some get posted a year later due to timing and some get posted a few weeks after my last class. I will keep the recipes exclusive to people who sign up for the class at least temporarily. The private FB page is only for people who have signed up as well.